Easy to prepare, healthful, and affordable, pasta is more popular than ever. Americans are eating twice as much pasta as they were just a few years ago. The new food pyramid and the Mediterranean diet advocate pasta and vegetables as a major part of a healthy diet. 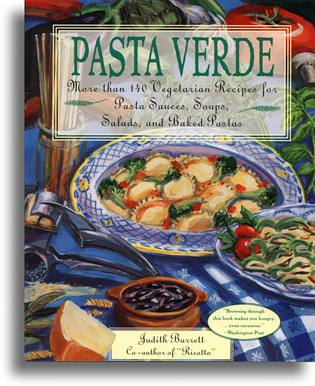 Pasta Verde offers 140 recipes for delicious meatless pasta dishes including recipes for soups, salads, and sauces as well as lasagnas, ravioli, and cannelloni. All of the recipes make use of the freshest ingredients like asparagus, broccoli, peppers, and wild mushrooms; savory herbs including basil, rosemary, and sage; deliciously tangy Italian-imported Parmesan cheese; and good-for-you olive oil. Lots of tasty garlic and hot red pepper enhance numerous dishes. From Italian classics to the author’s own personal pasta creations, all of the recipes are aimed at keeping preparation simple and using readily available ingredients, making Pasta Verde a must for all pasta lovers.